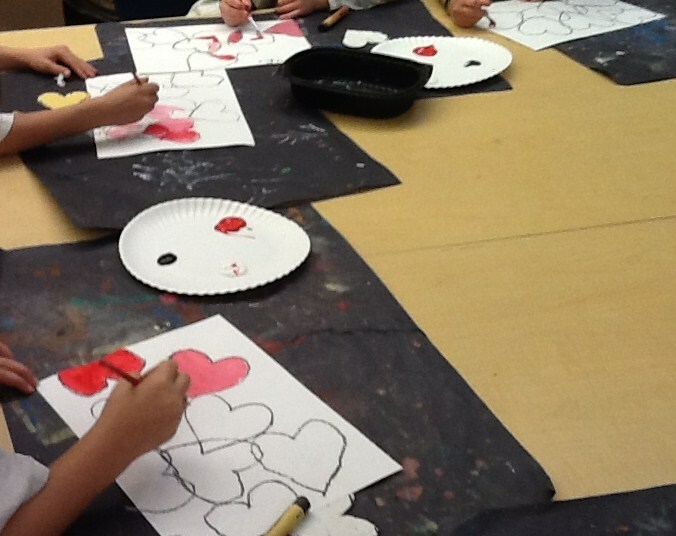 Preschool students traced around a heart template in an oil pastel color of their choice. 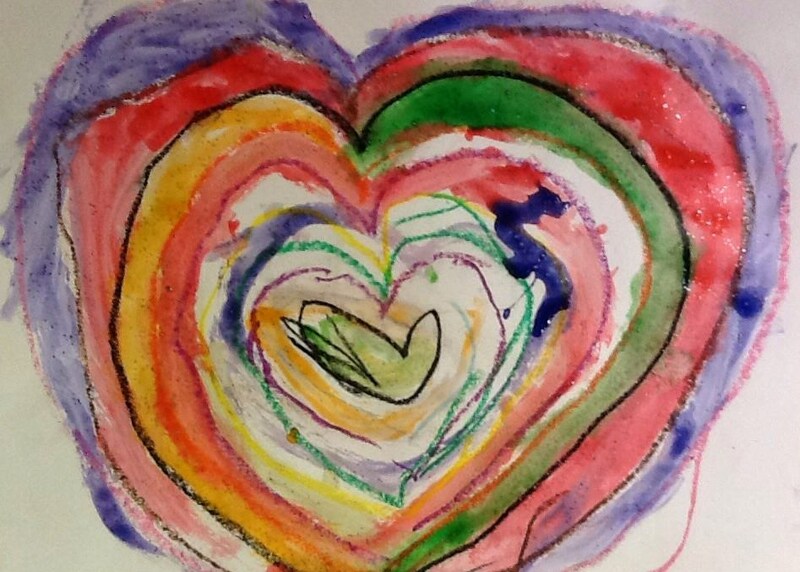 They traced around that heart with another color and traced around that with another color until the heart was so big, it fell off the page. 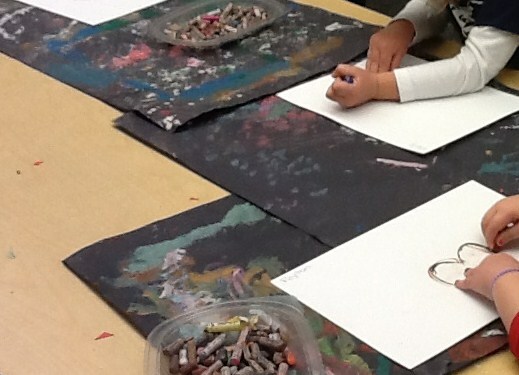 Once complete, the students painted in between the crayon lines with glitter paint. I have used watercolor for this lesson as well and I am sure you could use tempera cake. 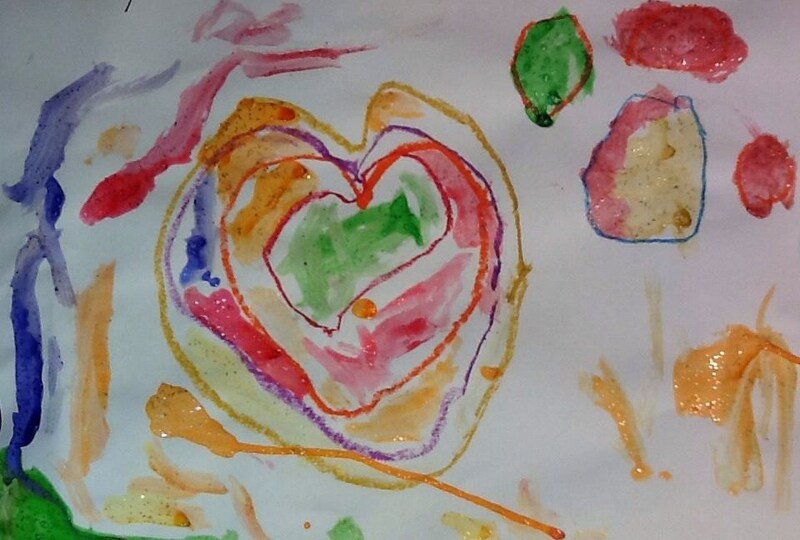 For this lesson, 3 year old preschoolers printed shapes onto narrow sheets of paper. 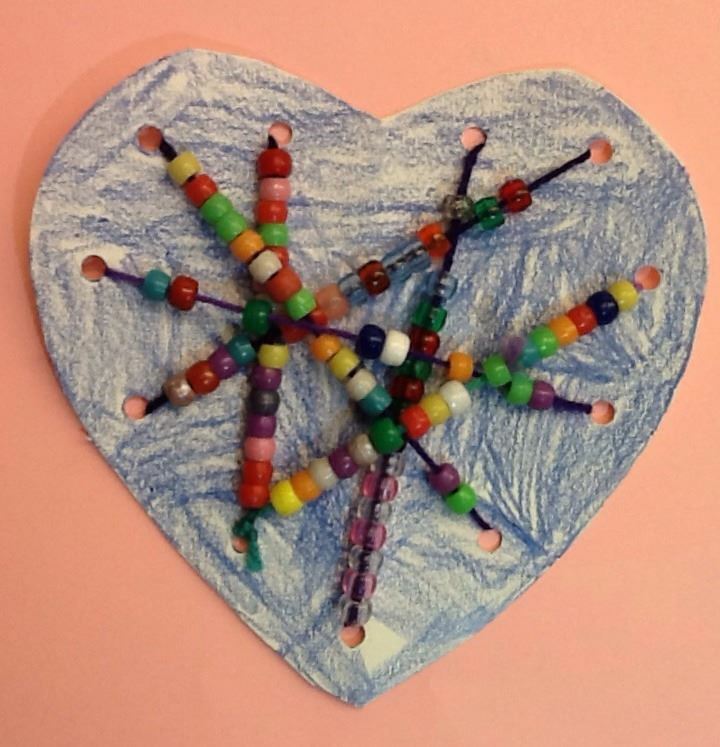 We used forks, bottle caps, and cardboard tubes that were cut and formed into a heart shape. 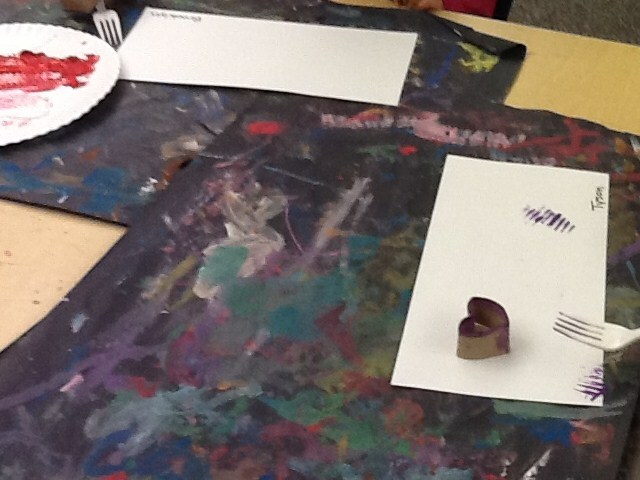 The students dipped the printing materials in paint and pressed it to the paper. 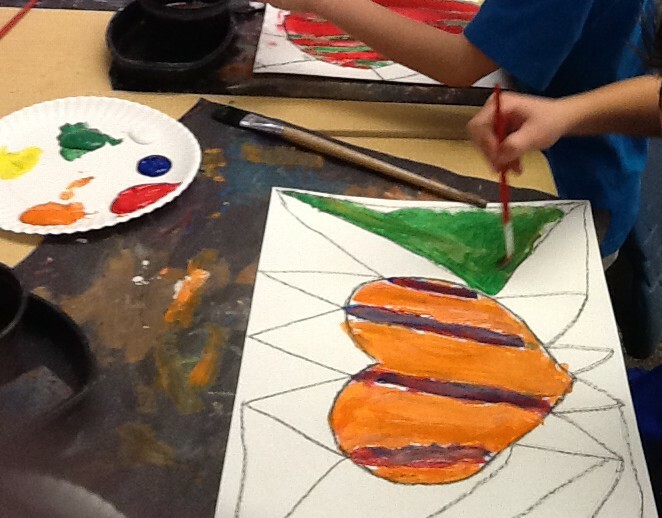 They were encouraged to create a patterns Some enjoyed that idea more than others. Wassily Kandinsky’s Concentric Circles has inspired numerous art lessons. 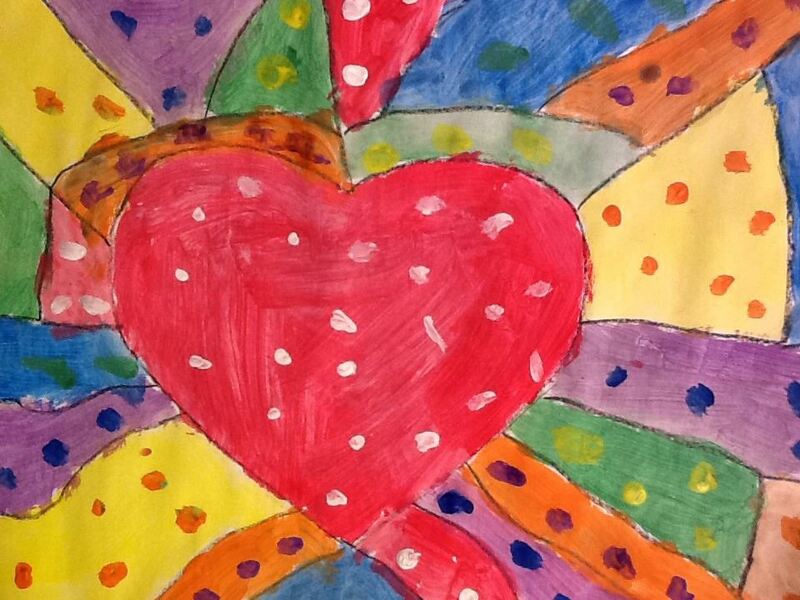 This year, Kindergarten students used Kandinsky’s Concentric Circles as a springboard for this heART lesson. Students began with a 12×12 paper that had been lightly pre-folded into quarters. 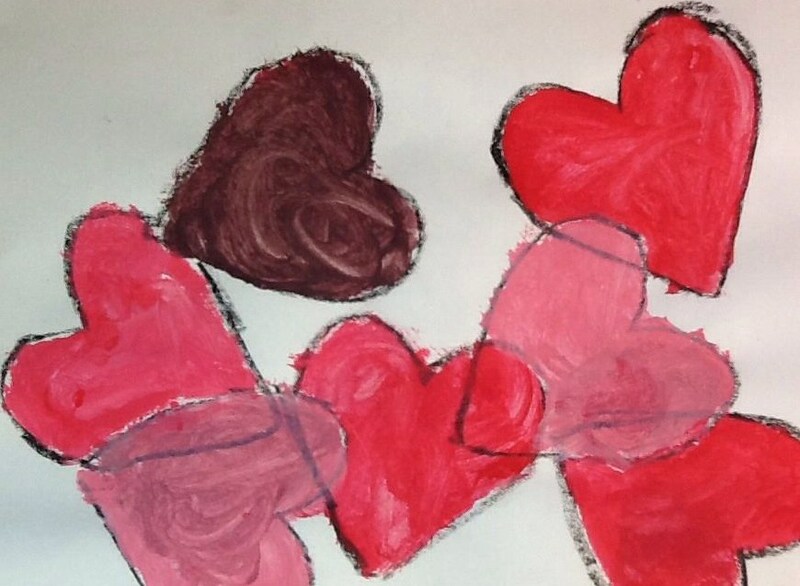 They drew a heart in each quadrant then painted around the hearts until the paper was covered. There is one preschool group that I am quite fond of. Last year, they were my “p.m. 3’s” and there were just 9 of them so we had a lot of fun doing completely different lessons than I typically do with preschool. This year, they are the “p.m. 4’s” and while they have added 7 students, the small class size allows me to do projects that require more prep work like this one. All of my preschool classes come with parent helpers, their classroom teacher and the classroom aide. It is pure bliss from my perspective. Lots of extra helpers with these littlest artists make things run so much more smoothly! Our parent helpers are encouraged to work at a table that does not have their child at it so the art can be more authentically preschool. 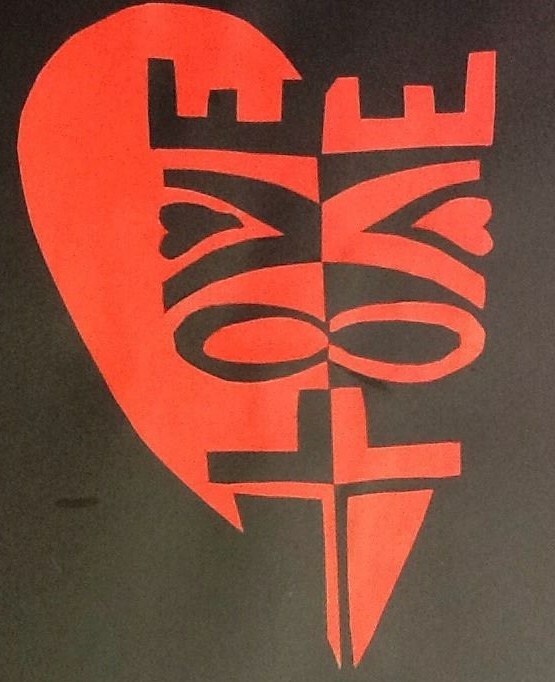 For this lesson, I cut out hearts from cardstock and punched 6-8 holes around the edge of the heart. I threaded the needles with yarn, tying the yarn to the eye and then taped the free end to the back or tied the free end to a hole. 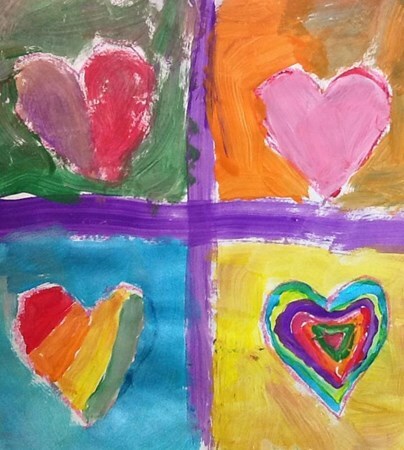 Students colored the hearts with crayon. 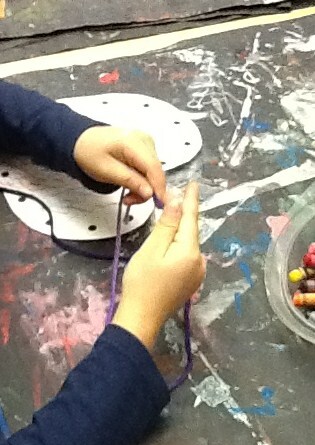 Many of them already use the sewing cards in their classroom so this was not all that difficult. For those who were not familiar with sewing, I did show them how to send the needle in and out of the holes. I also showed them how to add beads to their yarn reminding them that the yarn must be on top of the heart when beading for best results. 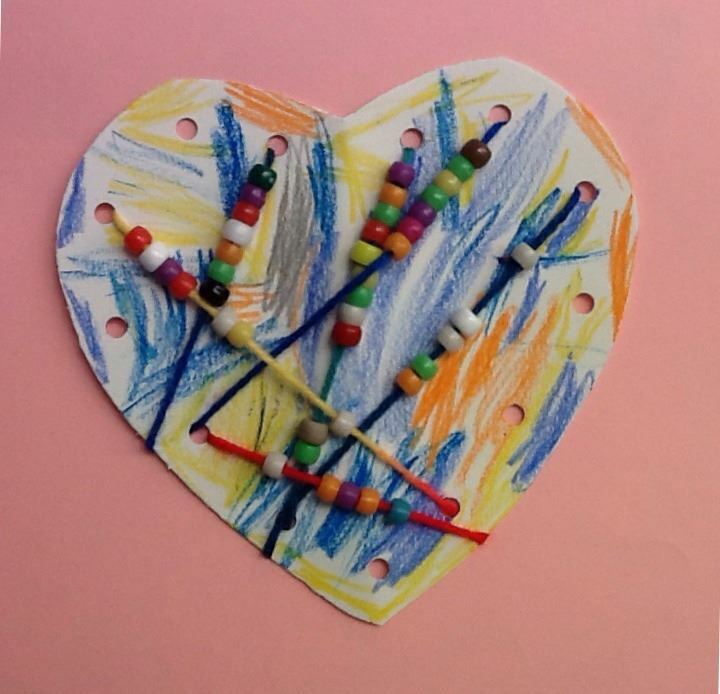 Once they had sewn and beaded to their satisfaction, an adult taped the free end to the back of the heart. 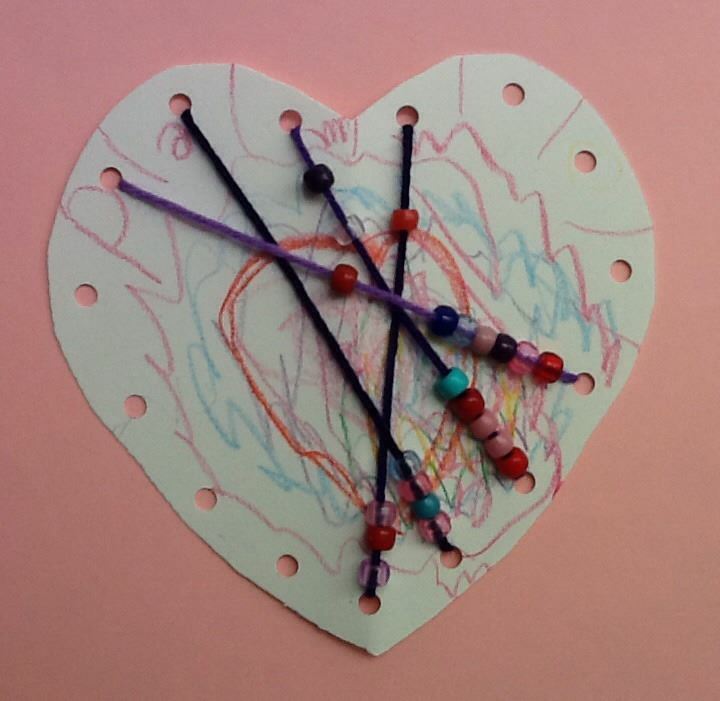 TK used a template to trace a heart onto their paper. 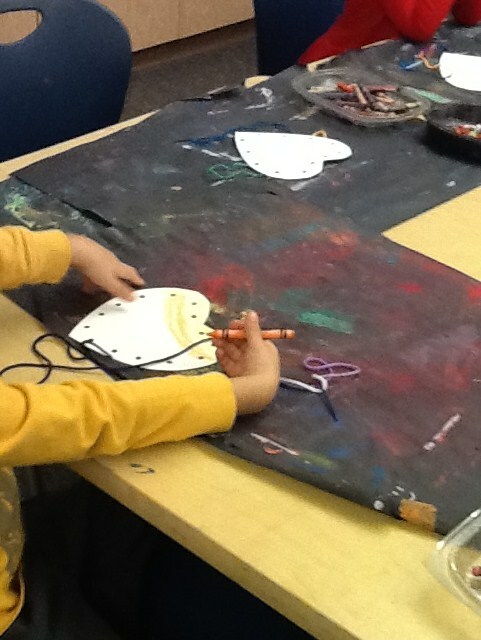 Once complete, they used primary colors to create secondary colors. 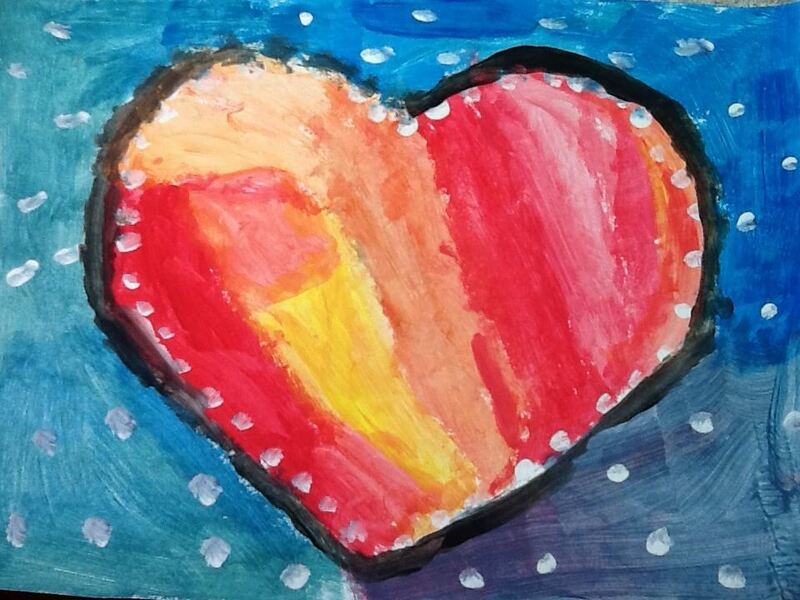 They used warm colors to fill in the heart and cool colors for the background. We do a lot of paint projects in my classroom. I allow for a lot of color mixing and self discovery but I also like to teach all of my students how to mix paint. 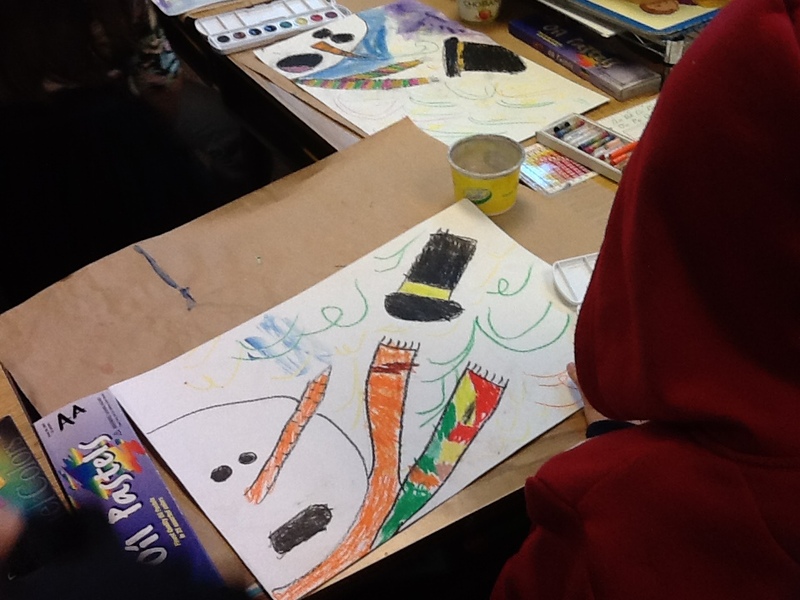 For this lesson, the objective was to create tints, shades and tones. I think it is important to show them that monochromatic does mean boring. 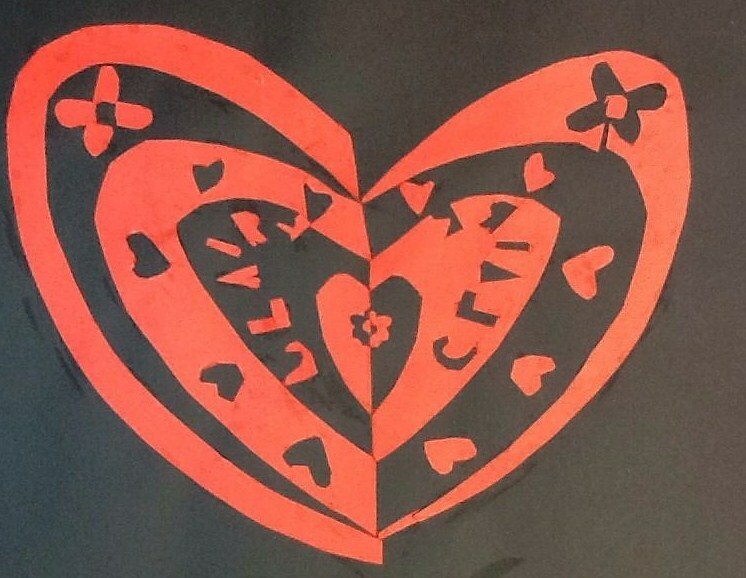 For this lesson, students traced a heart template using black crayon. 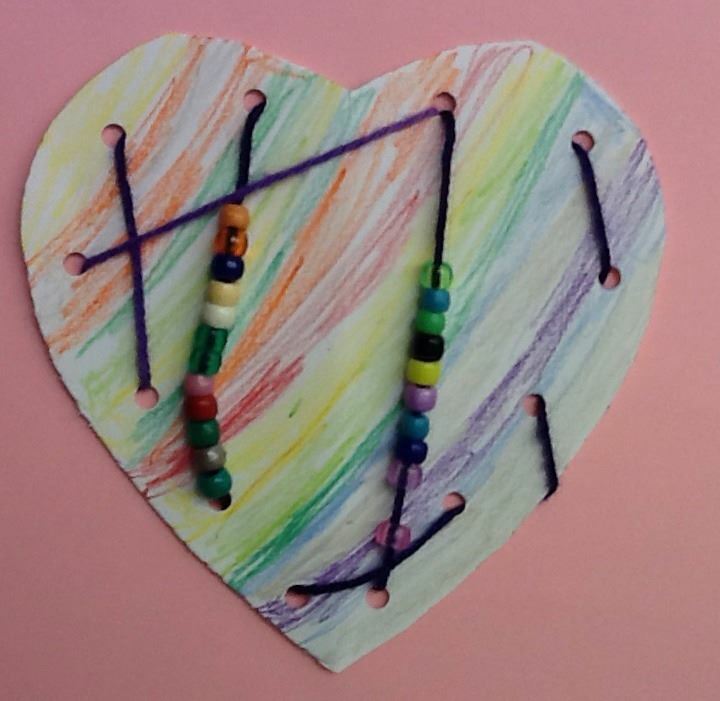 They could overlap the hearts, create a pattern and/or go off the page. 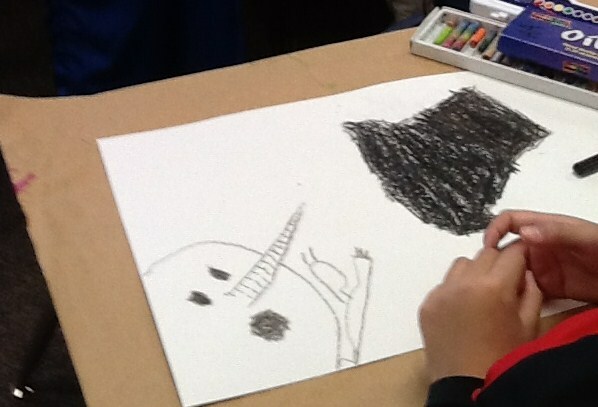 Once complete, we discussed how to make tints-add white, shades-add black and tones-add grey. 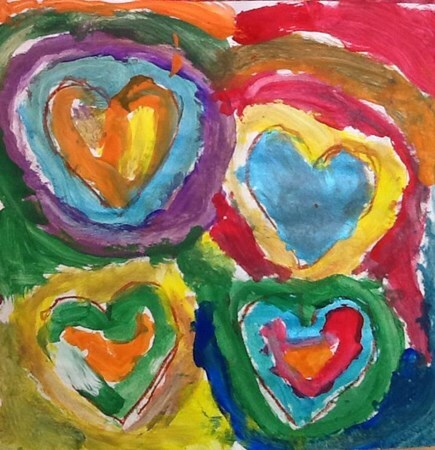 Then the students filled in the hearts with color. Japanese Notan is the play between light and dark or positive and negative space. I have done a version of this cut paper Notan for many years. 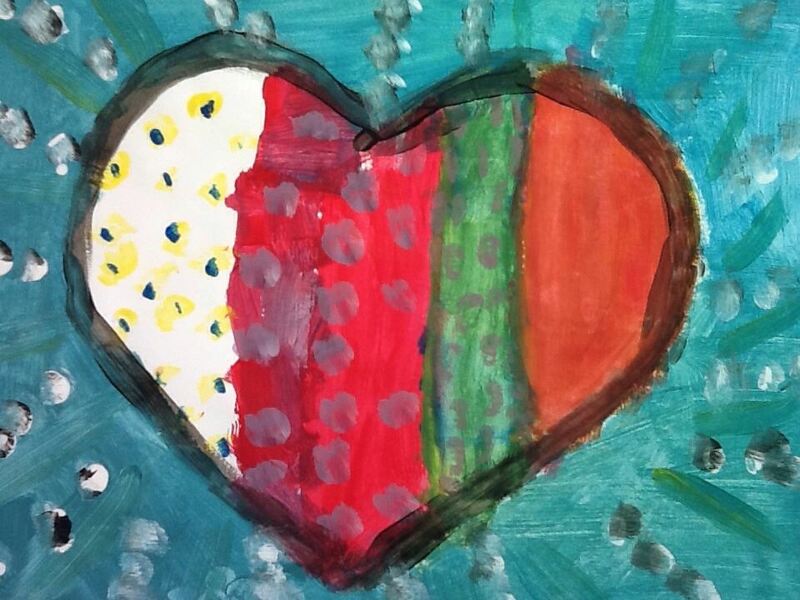 For this lesson, 5th grade students started with half of a heart. They drew patterns then cut, flipped and glued the parts to create these images. 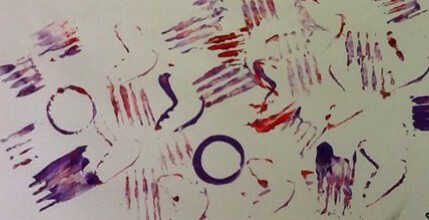 I took a great one day workshop in Mission Viejo for teachers called Circle Painting. It was a lot of fun to learn and create with other educators. Thick Paper plates. Painted a solid color and then the magic happens. We each painted a little something on the plates then chose 2 to take home. Great idea using cardboard cup holders for the paint cups. 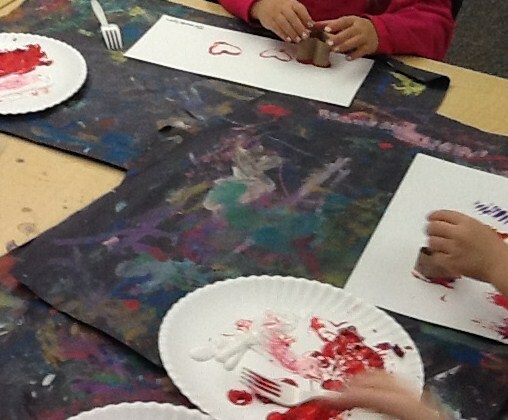 Hiep talks about paint cups being in the tray or in your hand at all times to prevent spills. Brushes of all shapes and sizes! 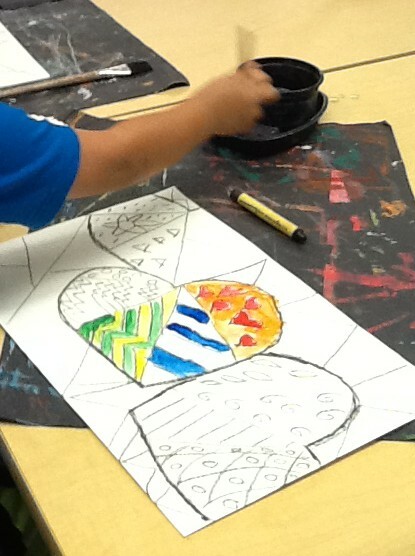 Last year, I had the grade one and two combo class students look at the work of Romero Britto. 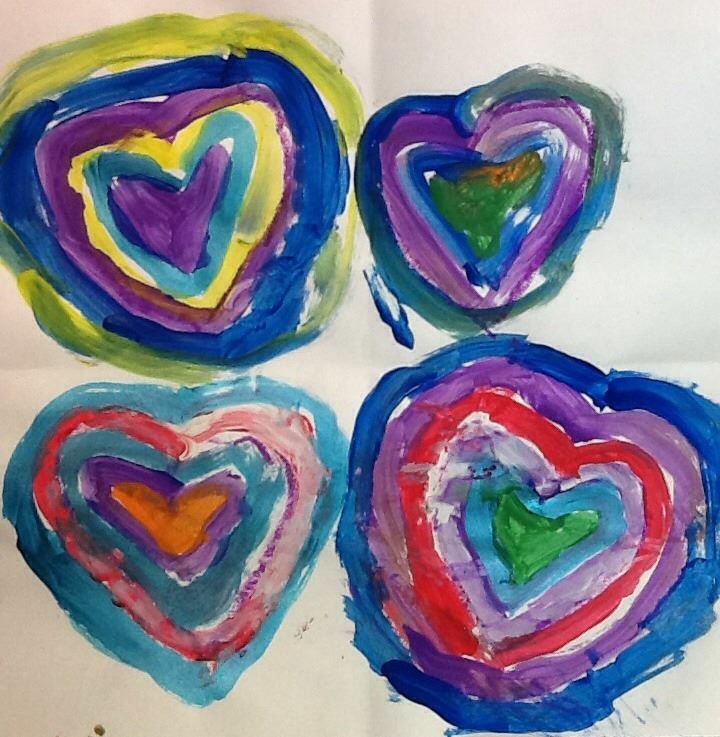 We talked about the artist and they used tempera paint to create bold and colorful hearts. When they finished, they could add black to create outlines. This year, I had all the first grade classes do the lesson. 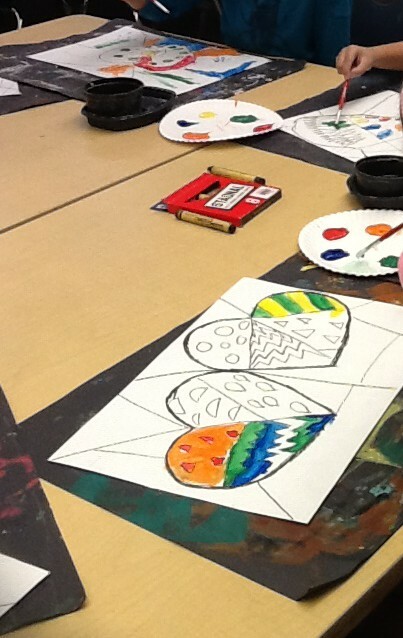 We looked at artwork by Romero Britto and discussed the images. Then the students got to work. 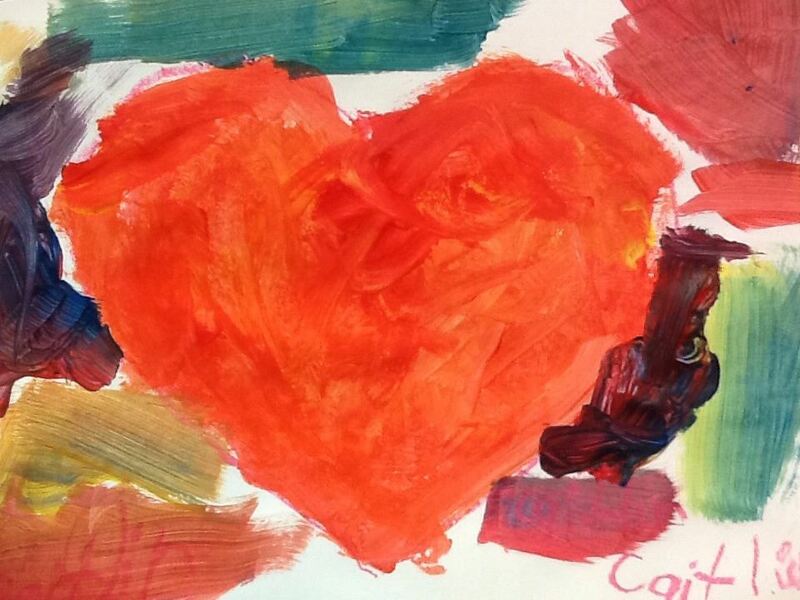 I asked them to draw a large heart or two then paint. I had templates they could use or they could draw their own. 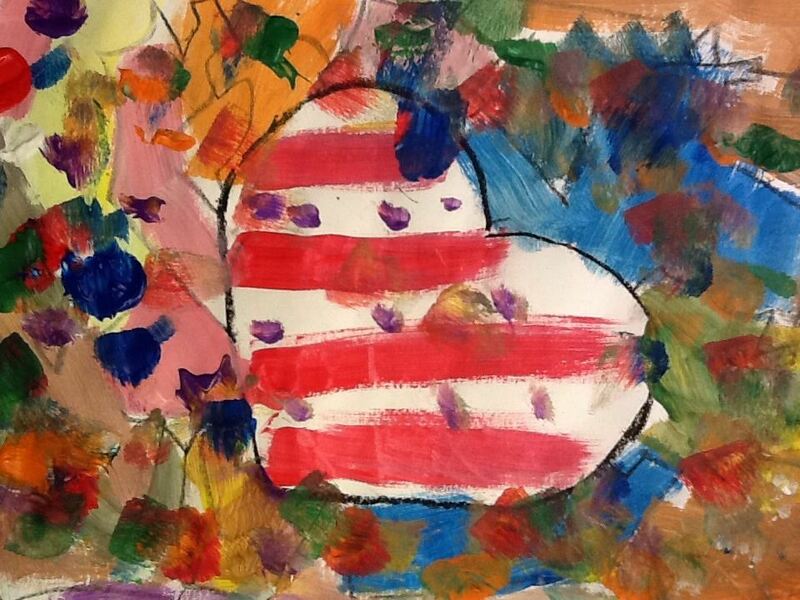 After they drew the heart, they fractured the background to create areas to paint. 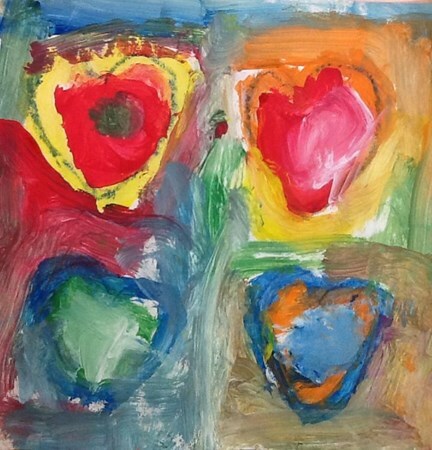 What we learned in the first class was that those who used thin paint layers and quickly covered the paper in color were able to complete the lesson in our 40 minute slot. After the paper had color, they could easily add patterns and details. One student commented that they looked like quilts. I love when they make connections like that! I subbed for a colleague and she left a sample of this lesson for me to create with her students. I didn’t see any directions until the end of the day after the kids left so this is how I did the project with the students. To begin, I had the students draw the snowman’s head in the lower corner of the paper leaving a space for the carrot nose. They added eyes and a mouth and the little stripes on the carrot. We talked about what it looks like to have the wind blow and I showed them examples of art pieces that show that type of thing. I demonstrated each of the steps by drawing it on the white board. We looked at the example and discussed the shapes we saw in the hat, the nose, the scarf, etc. I always tell my students to look for shapes you know. I broke it down so they could more easily see what lines and shapes made up each component of the snowman. Curved lines that look like a “c”, angled lines that form a skinny sideways “v”, straight lines, etc. They put a band on the hat and added a scarf to the snow man. I also told them they could add images in the background. If they did them in white, it would be kind of like magic. 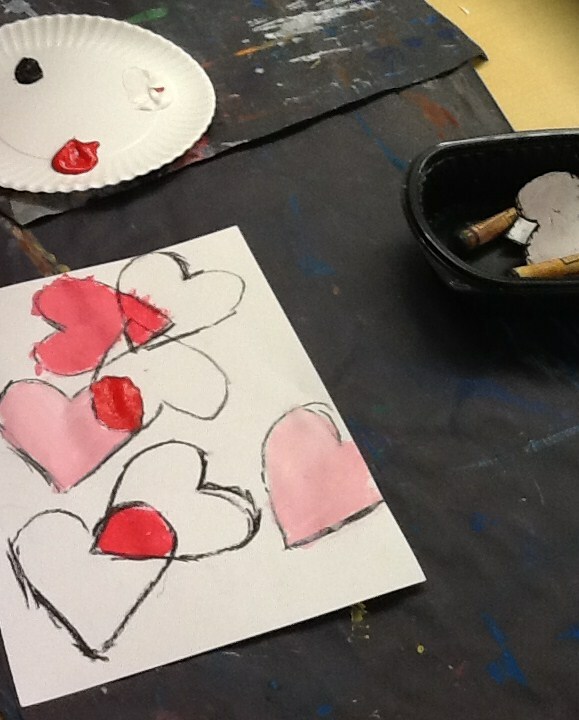 Students always love the way those white images “magically” appear when watercolor paint is applied. I think they came out quite cute. I like the personalities that each snow man has.